They're back ... Right whales return to Ga.
Four south Georgians are charged with shooting 18 protected wading birds in an Echols County incident one DNR Law Enforcement Division veteran called “the biggest disrespect to wildlife” he’s ever seen. DNR Sgt. Patrick Dupree discovered the suspects and the dead birds Nov. 30 while on a dawn duck hunting patrol in west Echols County. 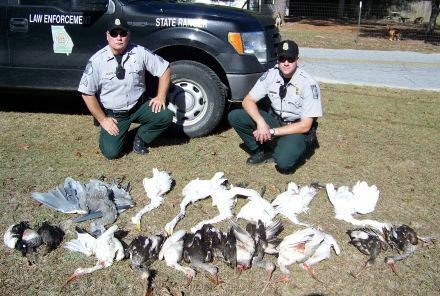 According to an investigation by Dupree and Ranger Daniel North, the four males, ages 16 to 27, killed 11 ibis, six egrets and one great blue heron, as well as nine hooded mergansers, one over the limit for the suspects. Dupree and North seized the birds, many of were left floating in the pond. “It is the biggest disrespect to wildlife I've ever witnessed in my 19-year career,” Dupree said of the incident. The suspects, residents of neighboring Lowndes and Berrien counties, were charged with taking protected wildlife. Two were cited for hunting license violations, and a third with taking over the limit of mergansers. The misdemeanor cases will be handled in Echols Probate Court. Report poaching and other hunting violations to the Ranger Hotline, 1-800-241-4113, or RangerHotline@dnr.state.ga.us. Showing a knack for timing, the North Atlantic right whale and calf spotted off Cumberland Island last weekend were Georgia’s first arrivals of the 2014-2015 calving season. A Florida Fish and Wildlife Conservation Commission survey plane photographed right whale number 2145 and her new calf, the 24-year-old mom’s fifth. Two more whales have been seen since. DNR wildlife biologist Clay George said both are known breeding females. The hope is they’re pregnant. That hope underscores the fact that Georgia and north Florida are the only known calving grounds for these endangered whales. Each winter, pregnant right whales and small numbers of non-breeding whales swim more than 1,000 miles from their feeding grounds off Canada and New England to the warmer waters of Georgia and northeastern Florida. Here, from late November through March, they give birth and nurse their young. The first whales are usually seen earlier. But George, right whale research leader for DNR’s Nongame Conservation Section, isn’t worried, pointing to January and February as the peak of calving season. 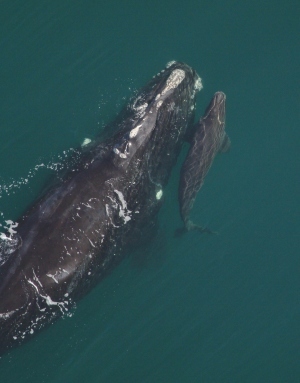 Once ravaged by whaling and now threatened by ship strikes and entanglement in commercial fishing gear (video), North Atlantic right whales are one of the world’s most imperiled whales. Their numbers are estimated at about 450. While the population is increasing 2.8 percent a year, there are fewer than 100 breeding females, and calving varies year to year. Only 10 calves were documented last winter. Read more, including cautions for boaters and a NOAA app for reporting marine mammal strandings. Watch this 2009 video of whale 2145 with a calf (New England Aquarium Right Whale Research Program). If you were asked to name four plants associated with Christmas, what would you say? You could not go wrong listing holly, poinsettia, mistletoe and the Christmas tree. All of these plants are linked to this special holiday. However, in the hearts and minds of most Americans, the plant that symbolizes Christmas more than any other is the Christmas tree. 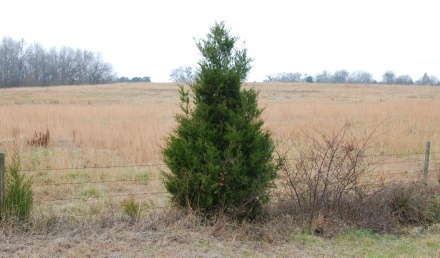 In Georgia, the Christmas tree of choice used to be the eastern red cedar, an evergreen most of us refer to simply as cedar. The tree is abundant, has a natural "Christmas tree" shape and fills a room with the pleasant aroma of cedar. While the popularity of red cedar has waned with people, it hasn’t with wildlife. In fact, red cedar is so valuable to wildlife, it deserves to be called the wildlife Christmas tree. 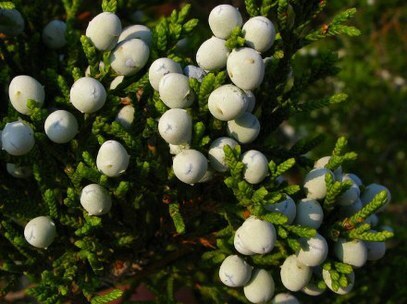 Read Terry’s column to find out why, from fruit to foliage, eastern red cedar is important to wildlife! Also watch as Charlie Elliott Wildlife Center’s Berkeley Boone talks red cedar in Talking Nature Tuesday. Terry W. Johnson is a former Nongame program manager with the DNR Wildlife Resources Division and executive director of TERN, the Nongame Conservation Section’s friends group. Out my backdoor library. This year proved a memorable one for conserving Georgia’s native wildlife and wild places. To help put 2014 in perspective, here’s a look at this newsletter’s 10 top stories. 1. "Eagle nesting soars to record"
DNR surveys show Georgia's bald eagle population reaching new heights. 2. "Wildlife tag prices cut, benefits raised"
State lawmakers lower the price and boost funding from DNR tags, a critical source of support for wildlife work. 3. "White-nose syndrome on the move"
Biologists document white-nose syndrome in northeast Georgia bat populations. 4. "Georgia aster on our minds"
Partners including DNR team up to conserve Georgia aster, helping keep it off the Endangered Species list. 5. "Youth Birding Competition goes national"
A national nonprofit hopes to involve more youth in birding, using DNR’s competition as a model. 6. "Ohio zoo makes clutch find for Georgia sally"
At Toledo Zoo, a Pigeon Mountain salamander nest is documented for the first time. 7. "Found: a Holy Grail of Georgia grasses"
Hirst Brothers' panic grass hadn't been seen in Georgia since 1947 – until botanists found it this summer. 8. "Reign of the den master"
In a northeast Georgia stream, scientists video hellbender breeding behavior that has rarely been seen. 9. "A new high for wood storks"
On the brink of down-listing from endangered to threatened, wood storks post a record nest year in Georgia. 10. "We’re in it for the long haul"
New Nongame Conservation Section Chief Jon Ambrose discusses the agency outlook in a blog Q&A. A cold-stressed manatee is out of dire straits – and the Savannah River – after Nongame Conservation Section, SeaWorld Orlando’s Animal Rescue Team and U.S. Fish and Wildlife Service staff captured it near Port Wentworth Monday (video). SeaWorld is rehabilitating the young, 800-pound manatee for release. Another manatee also spotted at a plant outfall on the river eluded capture, and officials remain on the lookout. These endangered marine mammals usually migrate to Florida for winter. But the warm water at outfalls can be a deadly draw, keeping manatees here until water temperatures drop too low for them to safely swim south. A manatee apparently warming itself on a mud bank near St. Marys was eased back into the water recently by a well-meaning person who thought the animal was in trouble. State and federal wildlife agencies stress that if you see a stranded, hurt or dead manatee, call marine mammal responders at 1-800-2-SAVE-ME (800-272-8363) in Georgia or 1-888-404-FWCC (1-888-404-3922) in Florida. The State & Tribal Wildlife Grants program held its own in the federal budget bill President Obama signed this week. This program considered vital to helping states conserve nongame, and keep species from becoming so rare they require federal listing, received the same funding for fiscal year 2015 – nearly $58.7 million – as in 2014, though that's still a far cry from the $90 million in funding four years ago. Nongame Conservation’s new assistant chief, Mary Pfaffko, knows Capitol Hill and State Wildlife Action Plans, the strategies required to receive State Wildlife Grants. Named to fill the former post of nongame Chief Jon Ambrose, Pfaffko previously worked with the Association of Fish and Wildlife Agencies on State Wildlife Action Plan issues, Teaming With Wildlife Coalition-building and nongame-related outreach to Congress. The rufa red knot, a robin-sized shorebird that frequents Georgia’s coast, has been federally designated as threatened, a listing DNR supported. 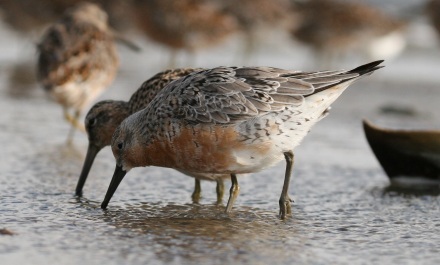 Impacts from climate change, coastal development and horseshoe crab declines linked to overharvest – the eggs are a critical food source for knots in Delaware Bay – have cut the numbers of red knots by 75 percent in some key areas. 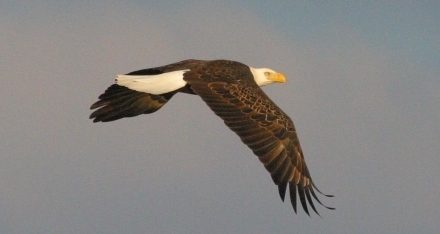 Listing decisions or proposals on 18 southeastern candidate species for Endangered Species Act protection are expected this federal fiscal year, which began Oct. 1, the Fish and Wildlife Service says. The agency’s 2014 list of candidate species is posted here. The cranes have landed. Seven whooping cranes led by ultralight aircraft made it to St. Marks National Wildlife Refuge on Dec. 11, capping the month-old whoopers’ first Wisconsin-to-Florida migration, a 1,100-mile trip spiced with a one-night layover in Georgia’s Decatur County and a weather-inspired decision to haul the birds by truck from southern Wisconsin to northern Tennessee (“Watch for whoopers,” Nov. 13). Photos. Crane cam videos. Migration map. What nongame wildlife gift keeps on giving? 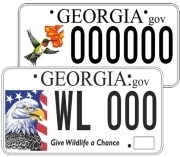 DNR’s eagle and hummingbird license plates cost only $25 more than a standard peach plate, and most of that fee – including when you renew the tag annually – goes to conserve Georgia wildlife, native plants and the natural habitats they need. Learn more. Comments on a new rule streamlining EQIP, one of the Agricultural Department’s largest conservation programs, are due by Feb. 10. The final rule includes Environmental Quality Incentives Program changes authorized by Congress in the 2014 Farm Bill. Also: Dec. 19 is the last day to sign up for this year’s program. An emergency decision to list three bats as endangered under Canada’s Species at Risk Act will help protect little brown myotis, northern myotis and tri-colored bats on federal lands and require a recovery strategy within a year, according to the Canadian Wildlife Federation. The species have suffered sharp declines due to white-nose syndrome. Names in the news: Gov. Nathan Deal honored DNR Law Enforcement Division’s Cpl. Josh Swain and Ranger 1st Class Ronnie Beard with the Governor’s Public Safety Award for rescuing four people on the Ocmulgee River last year. Swain and Beard braved dangerous currents and debris on the flood-swollen river Dec. 23 to ferry the stranded boaters from a small island before it was covered by rising water. “Swamp Brothers” star Robert Keszey has been sentenced to a year in jail for trafficking in protected snakes, including eastern indigos. Also found guilty in federal court was Robroy MacInnes, co-owner with Keszey of Glades Herp Farm in Tampa, Fla., base for the Discovery Channel series and a mail-order reptile business.